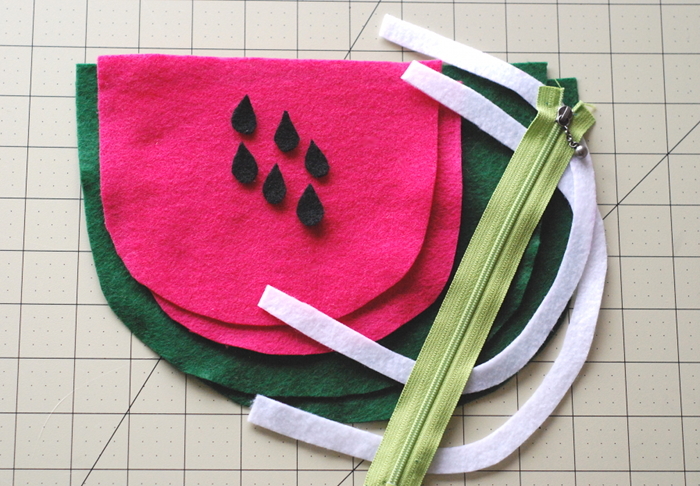 My last watermelon project was a stack of felt pouches to pack up the party favors. 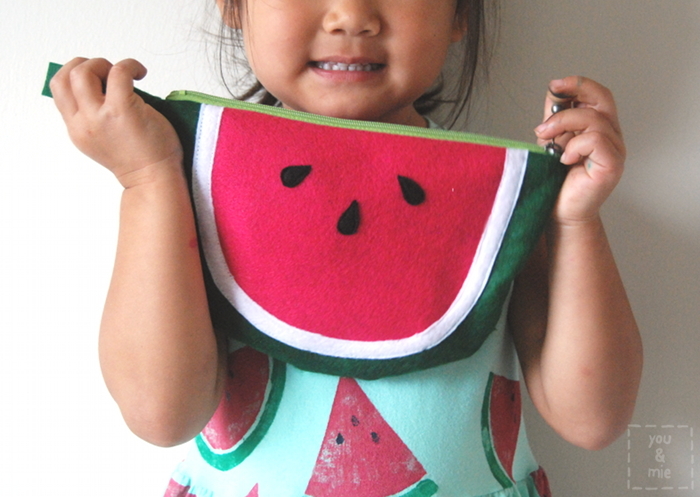 And I made a free pattern and tutorial in case anyone else wants to make one too! So here’s what I stuffed inside . . .
Here’s what you’ll need to make one! If you’re only making one pouch, you can buy the 9×12 sheets (quantity in parenthesis). 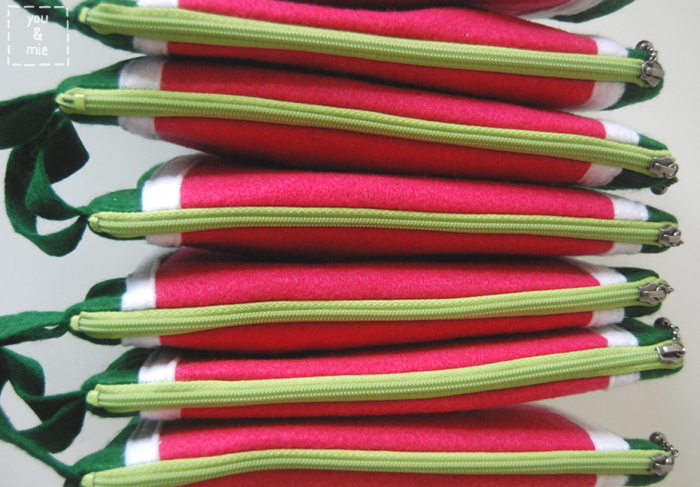 If you’re making multiples, I’d recommend buying yardage of the green, pink and white. Print your pattern at 100% or no scaling. 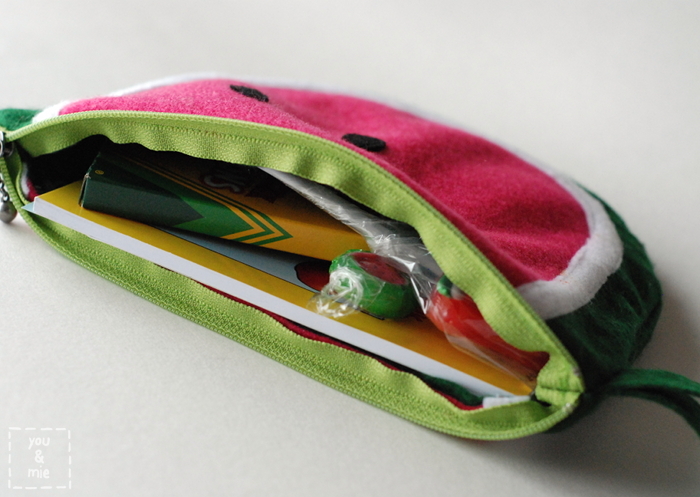 I forgot to add a square to make sure it’s printed correctly, but to double check, the long straight edge of the GREEN watermelon piece is 8 and 3/4 inches. I happened to find a bunch of these 8″ zippers for super cheap and they were perfect for what I needed. If you have a 7-9″ zipper, it’ll be longer than you need, but that’s totally fine. 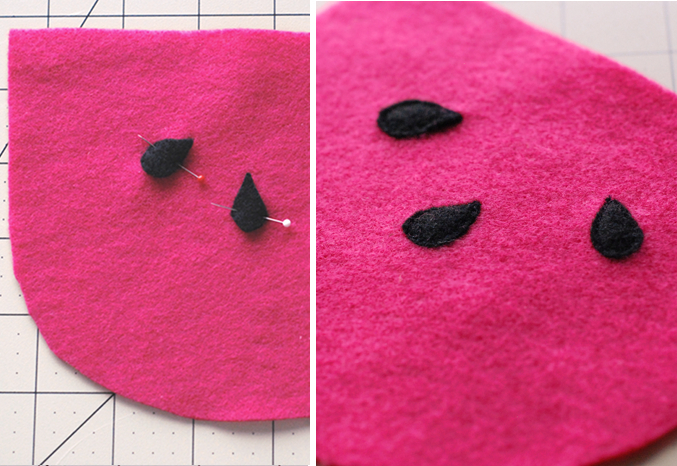 Cut out your felt pieces as directed on the pattern. The one thing that isn’t mentioned on the pattern is the rectangular piece you’ll need for the wrist strap. 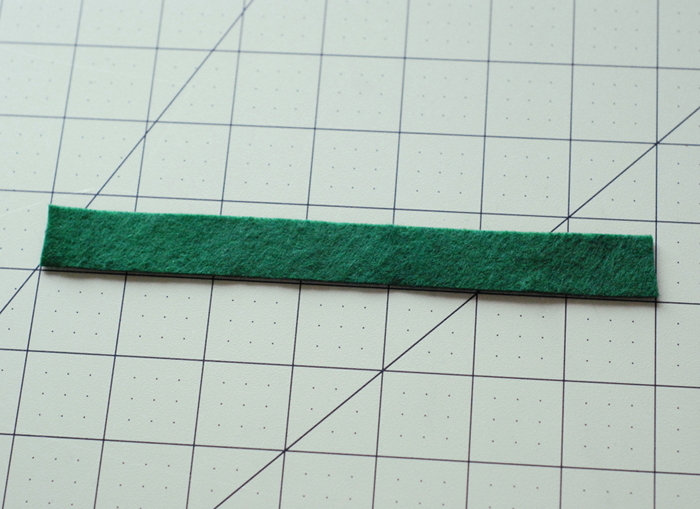 You’ll need a piece of green felt that is 7 inches by 3/4 of an inch. 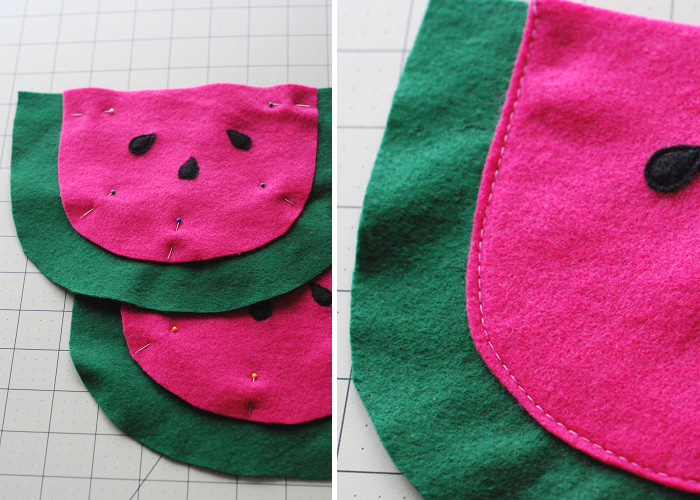 Pin your seeds to the pink felt pieces and top stitch down. Go slow around the curved edges. 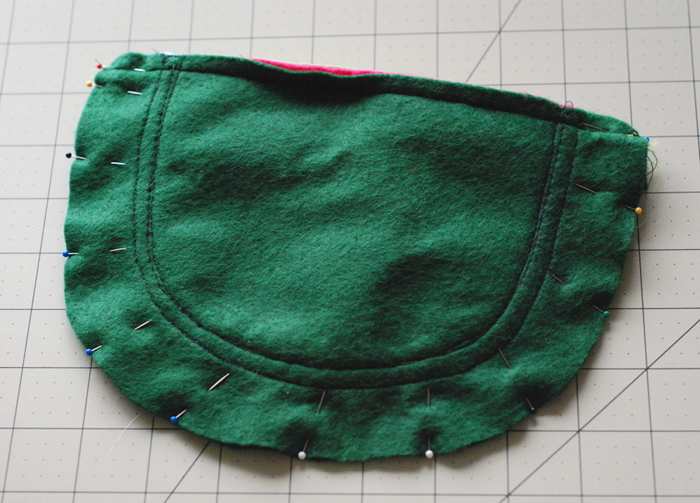 Pin the pink pieces on the green, centering it (you can fold each piece in half and line up the center marks). Baste in place. 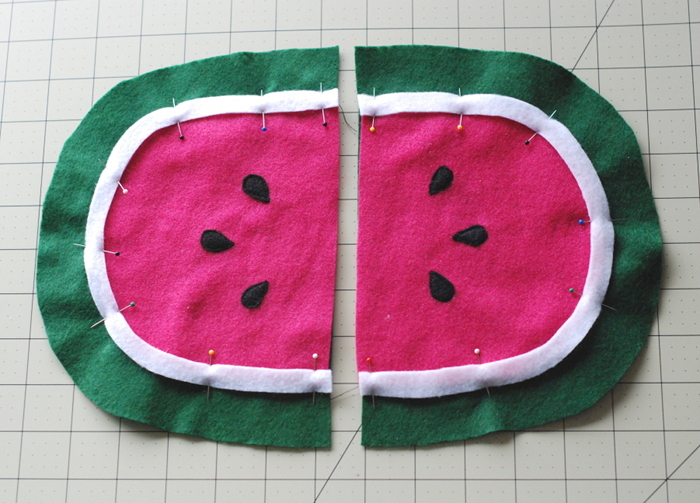 Pin the white felt piece down so that the inner edge is on the pink and the outer edge is on the green. I like to lay my pieces out like this so I can line the white pieces up with each other so they’ll line up when the zipper is installed (though mine still ended up uneven). 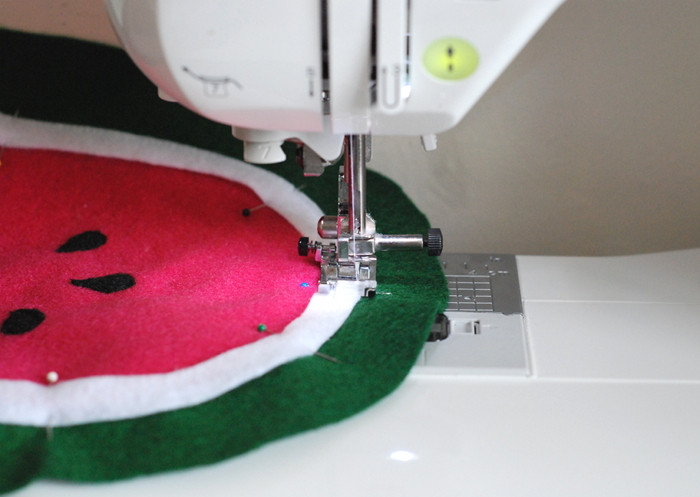 Sew along the outer and inner edge of the white piece as close to the edge as possible. 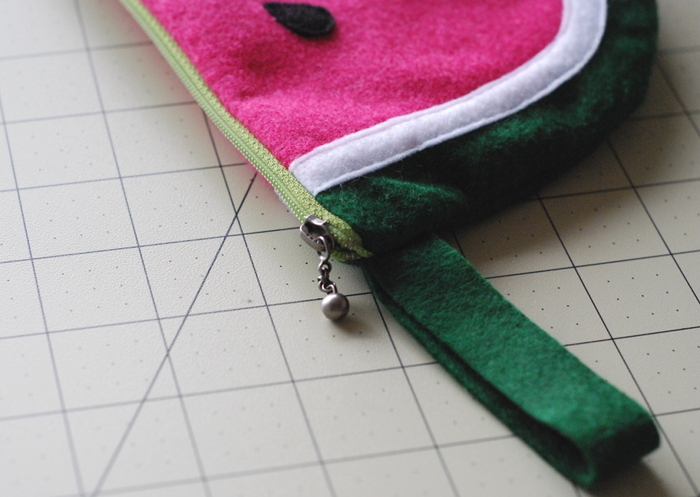 Pin one zipper edge to one side of the pouch, right sides together. 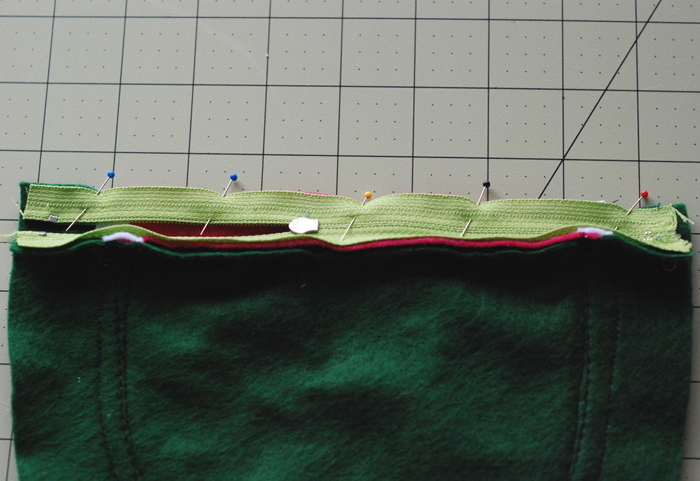 Place the end with the zipper pull 1/2 an inch from the edge. If you have an 8″ zipper, it should be centered. 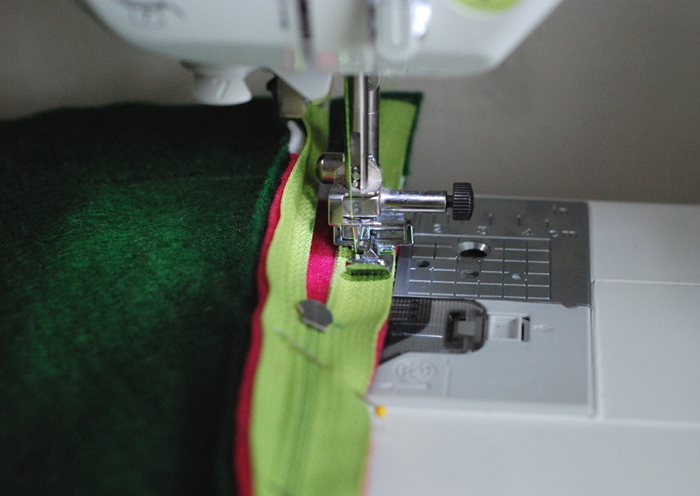 Sew along the edge of the zipper using a zipper foot. Pin and sew in the other side of the zipper along the edge of the other side of the pouch. Press the sides of the pouch open with your iron on low. 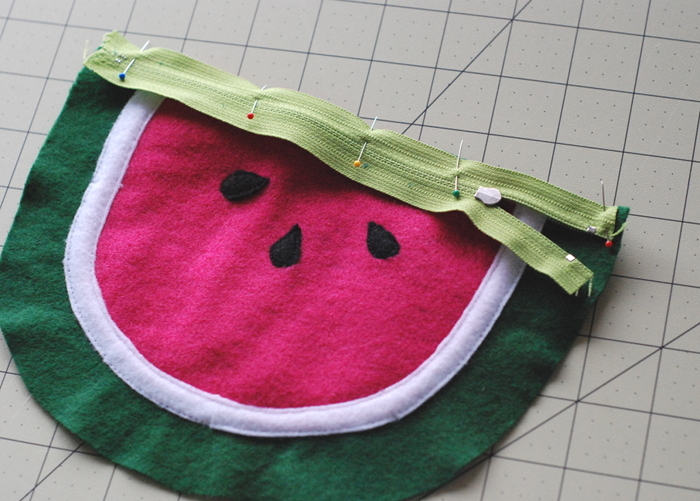 If you want to top stitch along the sides of the zipper, that will prevent it from flipping out when you unzip the pouch. I skipped this step because it was starting to get thick and I was worried it wouldn’t look very nice. Fold your strap in half and pin it to the right side of one side of the pouch with the raw edges aligned, just under the zipper. Baste in place. 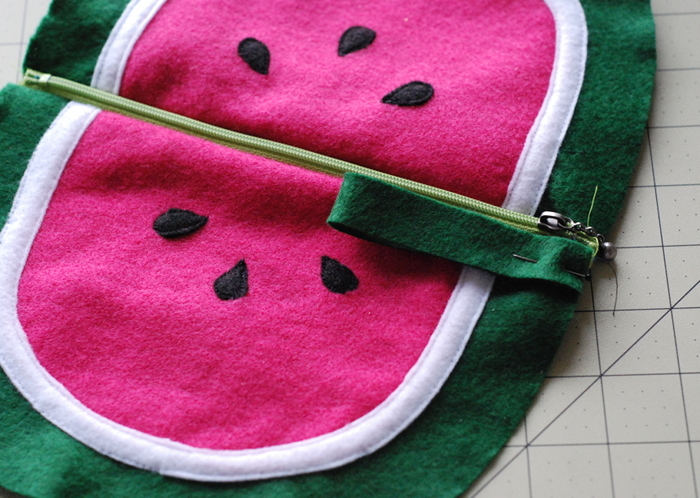 Fold the watermelon in half along the zipper, right sides together. Be sure the zipper is open at least halfway so you’ll be able to flip it right side out later. Sew along the curved edge with a 1/4 inch seam allowance and be sure to reinforce both ends by backstitching a few times. If you need to trim the zipper, do so at this time. Flip right side out and you’re done!! 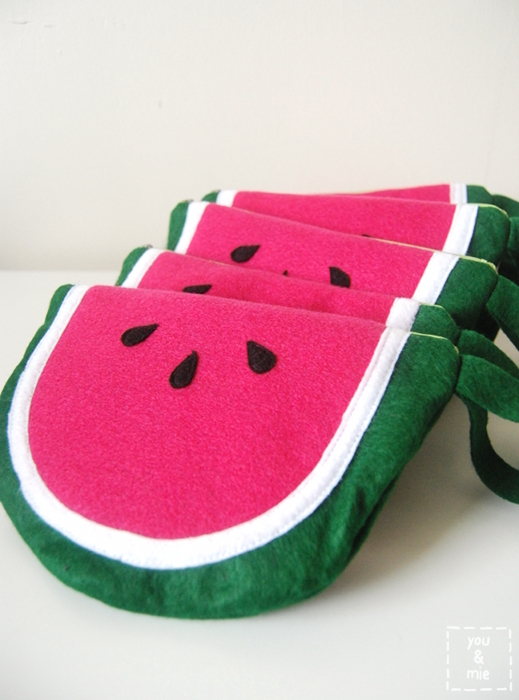 And if you decide to make one of these pouches, please share it with me by email or in the you & mie flickr pool! I’d love to see it! 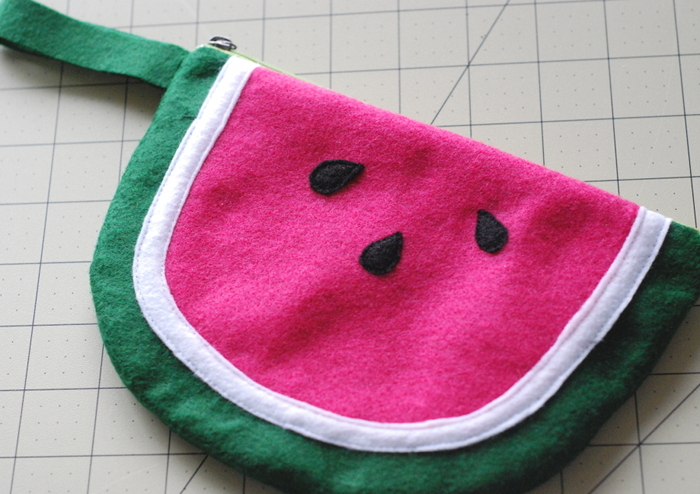 This entry was posted in party, tutorials and tagged felt, party favor, pouch, watermelon by Cherie. Bookmark the permalink. 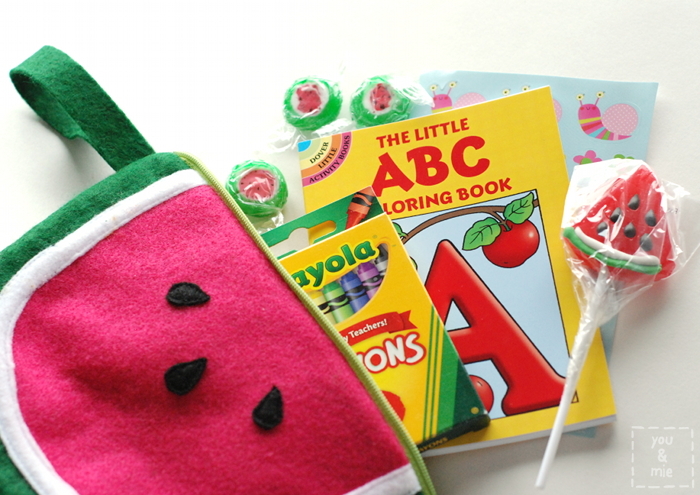 What a fun fun adorable party for your little sweetie! you are the best mom ever. i really want to come to your next “fruit” party. all of your ideas were so amazing! Those pouches are so cute!! They are gorgeous! Bet the party goers were delighted! Cherie this is brilliant!! Pinning! these are just soooo cute!!! What a fun summery party! 🙂 love it all! I love this! 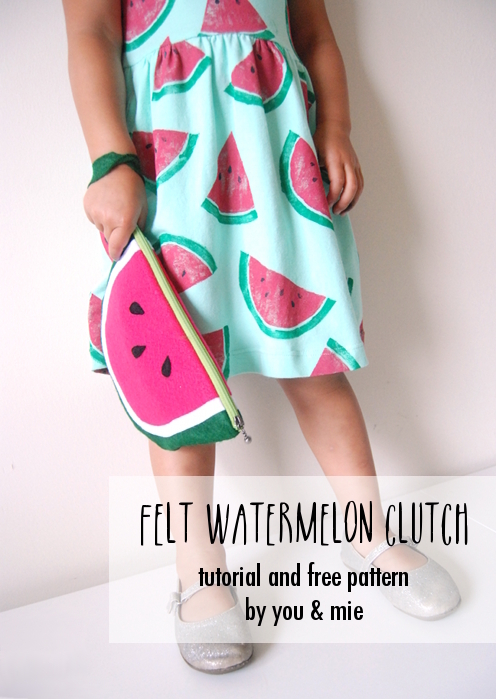 Thanks for the tutorial–the watermelon is so cute!